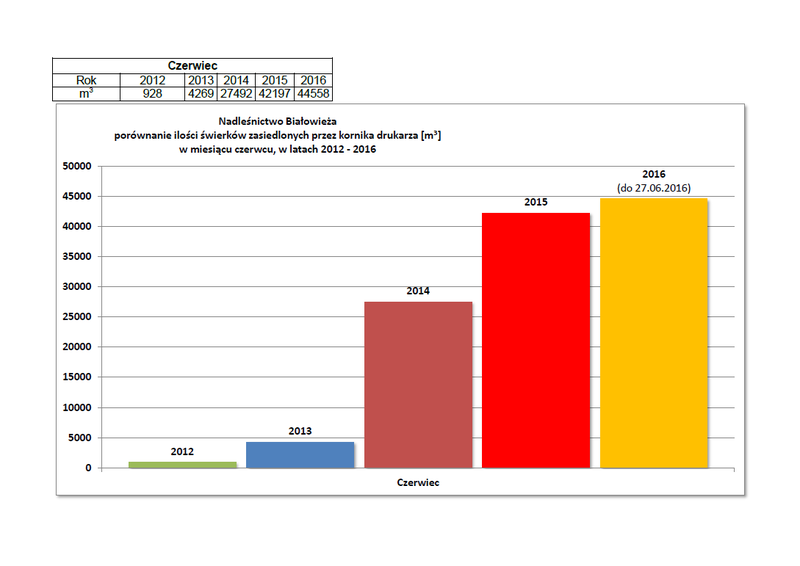 Against NGO activists’ and some scientists’ assumptions, bark beetle gradation in the Białowieża Primeval Forest does not seem to decline. In fact, the spruce tree dieback is more and more intensive. The monitoring of spruce tree stands conducted by foresters and the number of spruce trees marked as inhabited by the bark beetle have substantiated this information. 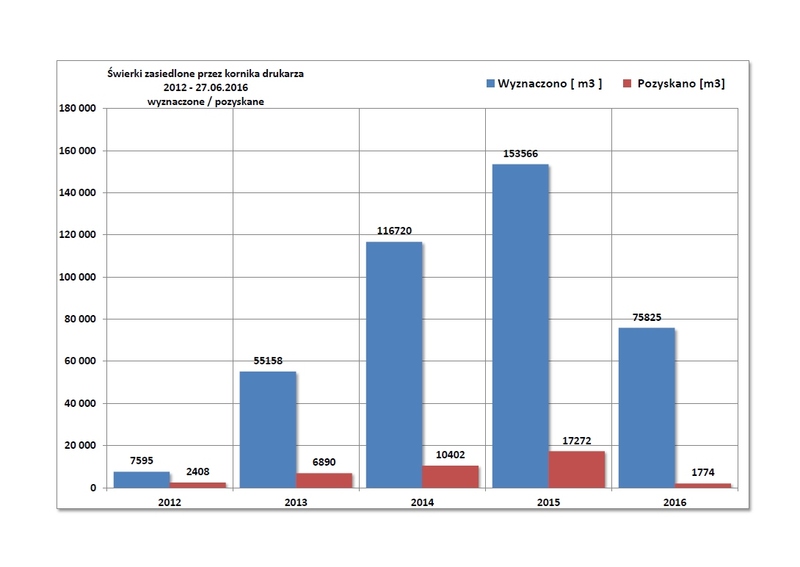 In the Białowieża Forest District (data for 27 June), since the beginning of 2016, almost 69 thousand spruce trees have been marked as inhabited, out of which only 3,3 thousand were removed. In terms of the mass of wood, out of 76 thousand m3, less than 2 thousand m3 of wood was removed. These works were performed in accordance with the forest management plan applicable in the forest district. In order to reduce the bark beetle gradation, foresters exhausted entire logging limit planned in the original version of the Forest Management Plan. 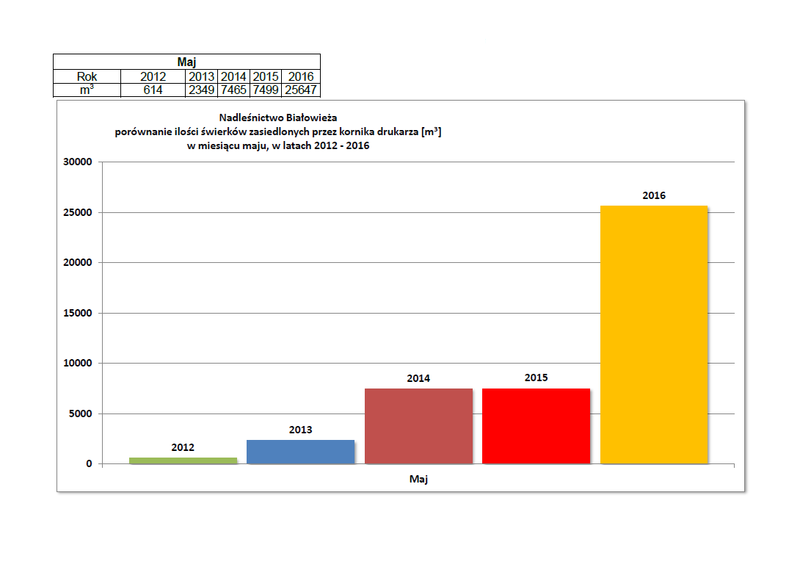 The Białowieża Forest District has not yet started to remove inhabited by the bark beetle trees, within the scope of additionally increased logging limit, determined in annex to the Forest Management Plan ratified on March 25, 2016 by the Minister of Environment (annex enables to log up to 125 thousand m3 of wood during 6 remaining years of the Forest Management Plan). Over 22 thousand spruce trees inhabited by the bark beetle were marked within tree stands beyond the reference area in the same forest district. Within the reference zone, where forest is left to nature, and foresters’ work is limited to the minimum, there are more than 46 thousand marked trees. While comparing the data from May and June in the years 2012 – 2016, it is evident that in 2016 the bark beetle expansion dynamics is much higher than in recent years. During one week of June, foresters collected from insect traps over 46 litres of bark beetles (equivalent to about 1,8 million adult bark beetles). Since the beginning of May foresters collected more than 4,5 million bark beetles. The lack of possibility to undertake active protective measures, determined in Forest Protection Instruction applicable in the State Forests, leads to spruce tree stands’ decay, degradation of natural habitats, and moreover it poses a threat to the persistence of the forest ecosystem. The problem concerns especially three stands aged 100 and over, which are the most precious. However, even younger trees, that grow nearby older and inhabited by the bark beetle trees in the Białowieża Primeval Forest, die.